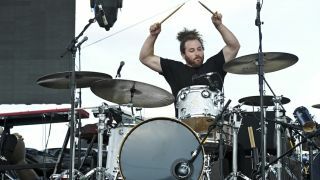 You may know Dave Elitch as the insanely skilled former Mars Volta drummer - but there's much more to Elitch than meets the eye. Not only is he behind the kit for metal supergroup Killer Be Killed (also featuring Mastodon's Troy Sanders, Max Cavalera and Dillinger Escape Plan frontman Greg Puciato), he also has a new, er…supergroup with Flea and Mars Volta band mates Omar Rodrigeuz-Lopez and Cedric Bixler-Zavala, and somewhat unbelievably he's also recently toured with Miley Cyrus. We just needed to hear how all of this went down, so we got Dave to tell us in his own words. How did Killer Be Killed first come about? "Greg and I have been good friends for years. We were hanging out at NAMM a few years ago and he told me that he'd been sending rough ideas back and forth with Max and that he wanted me to play drums on whatever the project was going to end up being. That led to the three of us locking ourselves in a rehearsal studio 3-4 times over the next several years for about a week each time and we wrote the bulk of the music that way. Once it was clear that we needed a bassist, I called my good pal Troy Sanders from Mastodon and he was immediately into the idea. We got to know each other from when I toured with The Mars Volta and we played shows together with Mastodon. After that phone call, Troy came out and it just gelled beautifully from the first note he played." How did you approach writing and recording with the band in terms of drumming? "When I get the chance to come up with my own drum parts, the vocals are always my first priority if there are any. I want to be supportive and stay out of the way. It was funny because Greg and Josh (Wilbur) had to keep yelling at me to play more fills, or busier in parts, etc. I have nothing to prove at this point, so I want to make a statement, but it doesn't necessarily have to be one strictly of technical virtuosity. I want everything to fit together and feel good. That's what's important to me." Did you try anything you hadn't tried before in terms of the sound you wanted? "Not really, I just let Josh do his thing as far as recording techniques go. He knows what he's doing and I trust him completely. I brought it my good buddy Chris Heuer to tech for me. He's the only person that I let touch my drums. He's an absolute master craftsman as well. Vinnie Colaiuta is actually playing his drums on tour with Sting right now. He makes great stuff!" What kit did you use in the studio? "I used two kits actually. I used my custom DW acrylic kit on 8 songs. The sizes were: 8x12, 9x13, 16"x16", 18"x16", 24"x16". On the remaining 4 songs, I used my 1970's Ludwig stainless steel kit. I love that drum set! Everyone thinks they're loud, but if you put coated heads on them and tune em down and they're really quite warm and dark. Sizes were 14"x10", 16"x16", 18"x16", 24"x14". I own around 60 snares and I used 5-6 on the record, but the DW 14"X6.5" knurled steel, my 14"X6.5" '90s Tama Bell Brass and my 8"x14" 1989 Sonor Horst Link HLD 590 cast bronze snare were the that drums really won out over the others." How did the Miley Cyrus gig come about? "Stacy Jones has been her drummer and musical director for the past eight years. We originally connected through our mutual friend Jason Sutter. Stacy wanted to learn some cool licks, so he came over to my studio to take a few lessons and we just hit it off. He's a great guy and one of the few people I've seen that can hit really hard, but still have a great feel at the same time. Not an easy thing to do. Anyway, he was playing with Matchbox 20 while Miley was on a break and the two things over lapped, so he asked me to sub for him and it ended up being for a good amount of dates, which has been a ton of fun." That gig is quite a change from your other gigs, can it be difficult to switch gears like that? "That is exactly why I wanted to do the gig when he asked me. I had just finished recording the Killer Be Killed record a week prior, so I thought it would be really fun to drastically switch things up so soon. This was the day before "Wrecking Ball" blew up, mind you, so the timing was really perfect." "It went really well. It seems that I've developed a reputation to be a bit of a mercenary in that, people call me to come in with little or no rehearsal and do a very complicated show. It's happened with pretty much every touring gig I've done. One run through the set and then you're off. That means that you have to spend a lot of time preparing and doing your homework. No has time for you to screw up. I had to deal with a lot of electronics when I went out with M83 a few years ago, but there's just a lot more going on to worry about with Miley with it being such a massive production like that. "We played 20 songs on the main stage and then 5-6 songs on the acoustic stage, which was in the front of the arena. There are lots of cues and I also had to get comfortable with the muscle memory of playing the Simmons pads and dealing with the electronics. The band had two months of rehearsals and I had one run through the set after I flew in and then it was on. It was a great experience and I'm glad I did it. Stacy is back on the gig now." You also have a new band with Flea, Cedric and Omar, how did that come about? What are the plans there? How do you manage to juggle so many big projects? "Haha, I drink a ton of coffee! To be honest, I really have no idea. I can tell you that I put absolutely everything in my calendar and try to keep my schedule as organized as possible. That becomes invaluable in terms of my teaching practice especially. I'm also doing a fair bit of Skype lessons with people all over the world, so that can also be tough to find places to fit in. I also just squeezed in this recording date over the weekend doing double drums with the incredible Victor Indrizzo for a film called St. Vincent de Van Nuys. We had to play these weird stand-up drum kits, sort of like a cocktail kit without pedals. That was the first time I've sight-read charts since being in big band when I was in school, so it was super fun. Victor is such a great guy and a superb player. I love having the musical scenery constantly changing around me. I feel like I'd get bored if I had to play the same tunes or styles all the time." With so much going on how important is it that you stay in shape on the road to avoid totally burning out? "When I'm home, I go to the gym everyday before I teach. It started out years ago as me rehabbing a shoulder injury and also getting in shape for this band Daughters of Mara I was in. After a while, I just got addicted to it and it interestingly enough turned into my own sort of 'alone time' - a time and place to just turn my brain off and get away from everything. When I'm on the road, I'm usually so worn out, I rarely have the time or energy to work out, so I just focus on playing well and getting as much sleep as possible. Is there much common ground drum-wise between all of these gigs? "I'm sure there are common threads if you look hard enough, but no, not really. Between Killer Be Killed, Miley Cyrus and ANTEMASQUE, it couldn't really get much more different. I just try to be present in the moment and do whatever is the most appropriate for the situation, whether that's something as simple as drum/cymbal tones or how I'm approaching the music. I've always liked all kinds of music, so this has been really cool to have everything work out the way it did and be able to play such diverse music with so many great people. I couldn't be happier."